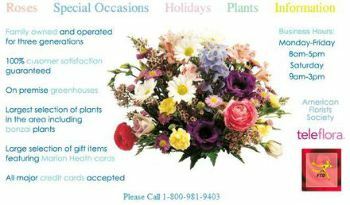 At Nuttelman's Florist we have a 100% customer guaranteed policy for all our products. Come visit our on premise greenhouses and see what we grow. This includes the areas largest selection of plants and flowers including Bonsai plants. May not be used for Teleflora orders. Limit of two Gift Certificates per transaction per day.